The leaves have a mildly sour flavor and are used in soups and salads. 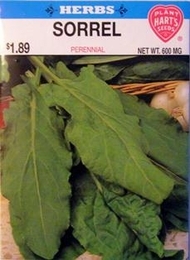 They also make excellent greens when cooked like spinach. Do not allow plants to exhaust themselves by going to seed. New plants should be started, or old plants should be divided. Planting time - Early spring or indoors 6-8 weeks earlier. Thinning - when plants are 2 inches tall thin to 8 inches apart.